The no-man’s land between Kenya and Tanzania is a mysterious place for many reasons. The biggest mystery of all might be why there is a border in the first place. Kenya and Tanzania are not naturally separate countries but repercussions from the British and Germanic empires dividing their holdings in East Africa. The two empires drew a straight line from the Indian Ocean to Lake Victoria bisecting tribes such as the Masai and natural parks such as the Serengeti and the Masai Mara. Whilst naturally so similar, it’s interesting to see how seemingly small decisions led to massive changes in the fates of the two countries decades later. These are our reflections on Kenya. Nairobi Airport at 7am broke any preconceptions the romantic traveller in us had of Africa. It was cold and save the zebra and elephant statues on the road from the airport, there were no exotic animals. The streets were filled with buses and cars that were old but not eccentric. The pavement began to fill with people walking to work. Whilst some friends shared a motorcycle for their commute, they were an minority compared to the ever increasing crowd of people flowing down the pavements on route to their jobs. For every minute we drove we passed at least a thousand people walked to work like an army of energetic ants swarming to their early start. There were no taxis, no briefcases, relatively few buses and, most revealing of all, no one sitting at the side of the road watching the world go by. Whilst this was a poor area of Kenya, it was industrious, serious, and everyone seemed to understand the need to get their job done. As we continued to drive we began to see the Nairobi skyline begin to grow. Skyscrapers pierced the cloudy morning sky and were spread wide apart making it difficult to pinpoint the centre of the city. 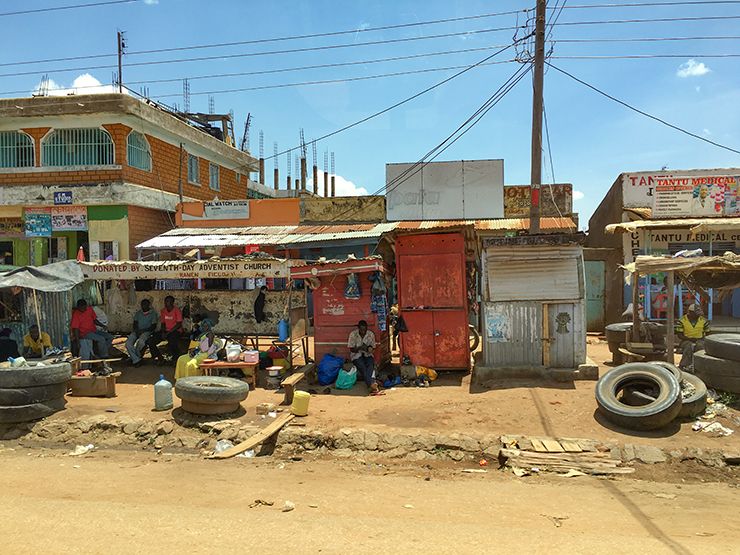 On first impression, Nairobi was not the Africa of clichés and stereotypes. Kenya and Tanzania became independent just two years apart. One key decision which affected the both countries was their choice of language. Tanzania chose Swahili as the primary language, with English the secondary language. Kenya chose English first and Swahili Second. The effect on Kenya seems to have been huge. English is spoken fluently and confidently by all and not just those involved in the tourism trade. Western and European companies, as well as International organisations based their African headquarters here. Most importantly of all education was able to thrive across the country. The result of the decision, and I’m sure many other political and sociological decisions that shaped the country, meant that Kenyans were well educated, charming, professional and efficient. For anyone looking for “mis-adventures” and “mis-understandings” in the heart of Africa…. Nairobi probably isn’t your place. The suburbs of Nairobi are their own little world. We visited a couple of animal sanctuaries in Southern Nairobi; the David Sheldrick Wildlife trust which rescues and rehabilitates baby elephants and the Giraffe Sanctuary that preserves the endangered Rothschild Giraffe. Both of these centres do great work and allow close encounters with the animals that western zoos or the wild planes of the Masai Mara can not accomodate. However, the centres were also smartly and efficiently run to secure funding for the rehabilitation and wellbeing of these animals. There were adoption packages and hotel tie-ins keeping the funding flowing. The suburbs themselves hint at the money that Nairobi generates and the new money residents that are building there. Housing complexes with private security continue to grow in the rich suburbs as the nouveau riche, Kenyans and foreigners, build modern palaces alongside the colonial houses left behind by the former British rulers. Across the border to the west rages a terrible civil war in South Sudan between President Kiir and his former deputy Riek Machar. However, in Nairobi they are neighbours with both families owning new palaces in the same gated private community. 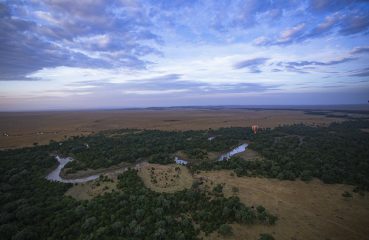 For us and our long weekend away there was only one destination we really needed to explore: the Masai Mara. We stayed in the north of the Mara, which we were told was the ‘Wild West.’ Whilst some areas of the national park are run and controlled by conservancies or private game reserves, this area was not heavily regulated. There were no main roads, just a myriad of dirt tracks that led you all over the plains. The tracks are rough and it is sometimes referred to as an “African Massage” as you bump along them in search of your game. The tracks are fairly punishing on long days but it does mean you have incredible access to the animals and it’s rare that, if once found, you will have to stare at a lion or Cheetah from a distance. There is no shortage of safari camps in this relatively small area. Kenya was decades ahead of its competitors when it started to develop its’ tourism industry. Unlike other potential safari destinations Kenya can offer a full range of safari options from budget to luxury that will tailor your holiday to your needs and budgets. Experience, competition, and education has driven Kenya’s tourism industry forward. 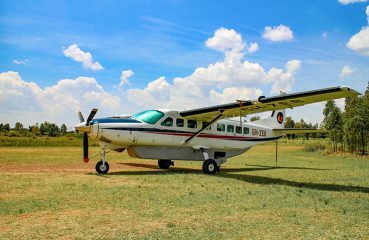 Airports, hotels, safari operators and travel agents are very professional, efficient, and extremely customer friendly. Unfortunately, the growth of the industry and the ease of access means that during peak season the Masai becomes flushed with tourists. A napping lion or a feeding cheetah may cause between 20 and 40 tourist filled jeeps to converge and watch ‘the show’: not exactly an exclusive and special experience. However, the Masai Mara during the migration is a magical place. Most travel destinations tend to pale in comparison with the images you see in travel guides and on Instagram. But, as we hurtled down the dirt track through the thousands of wildebeest and zebras, across the unending and undulating plains, I felt like I had stepped right into the pages of the Lonely Planet. The Masai and migration completely fulfilled our travel hit. We left Kenya for Tanzania but stopped over in Nairobi on the way back before flying back to Europe. We stayed at the Hilton in Downtown Nairobi. Our room was on the 12th floor and from that height Downtown Nairobi looked like downtown anywhere: tall skyscrapers competing to outgrow each other whilst the floor of the city was lit up with the neon lights of shops selling mobile phones and fast food into the early hours of the morning. The Hilton had strong security but it seemed more precautionary than reactive. This was the only thing that hinted that we weren’t in Manchester, Brussels or Berlin. Otherwise, our layover could have easily been just another city. It’s difficult to get a flavour of a country when you travel fast. To us Kenya came across as a progressive country which was trying it’s best to evolve and move forward. Whilst there are still some very poor and wild areas, the country as a whole is not as foreign as you might think. It’s easy to see why foreign businesses, investors and organisations are flocking to Nairobi. For the tourist, the level of education, professionalism and efficiency means your trip to Kenya will be smooth and hassle free. However, it does leave the intrepid traveller a little short on mis-adventures and tales of the weird and wonderful. We finished our trip to Kenya with a meal at the famous and infamous ‘Carnivore’ Restaurant. ‘Carnivore’ is a Brazilian Rodizio style restaurant where waiters promenade large cuts of African meat around the restaurant on Masai warrior swords . If your table’s flag is up, they carve large cuts of African meats such as Ostrich and Buffalo onto your plate. The meat is excellent, the accompanying sauces, such as fruit salsa and wildberry, are unique and delicious, and the service is excellent which all result in a hearty bill. The restaurant was originally infamous for serving cuts of game meat such as crocodile, zebra and other game animals. Our table had a small card on it which explained that, due to the passing of new laws protecting game animals the restaurant was no longer allowed to serve the exotic meats it was famed for and the restaurant apologised for this. I think Carnivore is very symbolic of the modern Kenya. It is professional, smart, well managed, lucrative and certainly worth visiting as it leaves the visitor with very little to complain about. However, by being so progressive it does seem to have lost a little bit of its African-ness in the process. I’ll leave you to decide whether that’s a good thing or not. We drove through the border crossing gates and into Tanzania. Crossing from Kenya into Tanzania seemed a little like having a birthday. Essentially you’re the same. The only thing you’ve crossed is an arbitrary barrier and you’re essentially the same as you were yesterday. But like waking up to a reminder that you’re now old, Tanzania gave us a quick shock as our phones and portable Wi-fi stopped working. And as we ventured deeper into the Tanzanian wilderness we began to long a little for the organised and progressive Kenya that we’d just left behind. Over the next few weeks we’ll be bringing you our adventures, experiences and reviews of our long Weekend in Tanzania including a reflection of our time there. We just returned from Jordan and I think you have described the Western misconceptions in Kenya in the same way we realized Jordan was nothing like we expected it to be, despite its location in the Middle East! We plan to take the kids on Safari and follow the Great Migration one day soon! Your post makes me want to go NOW! Oh wow, how was Jordan? I’d love to visit! The kids will LOVE going on safari, there’s just so much to see, do and learn! Hope you get there soon!! We often visit Kenya with our church to help the society and communities to continue growing and moving forward as you put it. Love this article and I would suggest everyone at some point visit there. Get a sense of humble and appreciation. Liz, that sounds amazing, such great work! I would agree and say that it is a truly humbling experience and somewhere everyone should visit. Really well written post and so fascinating to contrast Kenya and Tanzania like that, I had no idea just how progressive Kenya is. However, the idea of seeing a lion with boat loads of tourists is a little off putting! It’s a tough balance with tourism and exploitation. Thanks so much Bell. It was a real contrast for us to see. It is a really tough balance, but I don’t think any of the animals are exploited there. I always wanted to visit Kenya and also kept on guessing or wondering if it is safe to travel with my little ones:) Thought? Hi Bonbon, Kenya is absolutely ok to travel to with little ones. It would be a great experience for you all. Just make sure you book with a reputable company so you know (and can plan) what to expect.